This form should only be accessed by a Programmer or a Level 1 Administrator under instruction from the Programmer. It cannot be accessed by any other user with lower security access. 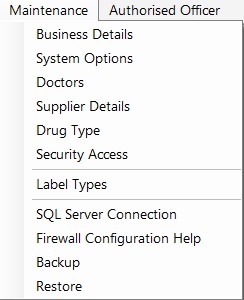 The form can only be accessed from the Maintenance Menu > SQL Server Connection. 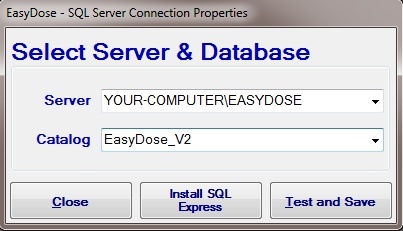 This form is used to connect to the EasyDose_V2 database. It is used during the initial setup and should normally never be used again except if something goes wrong with the server, the connection or the SQL database. Setting up the server/connection is explained in detail here.